Click on chart for in-depth premarket data. The retail sector remains in the spotlight on Wall Street as more earnings roll in. Shares of two troubled retailers, Best Buy (BBY) and Sears Holding Group (SHLD), fell in premarket trading after the companies reported quarterly results that raised new worries for investors. Best Buy reported that sales at stores open at least a year fell in the first quarter and are likely to be down in the second and third quarter as well. Sears Holdings, which operates the Kmart and Sears brands, announced the pace of store closings picked up to 80 closings in the first quarter and that further store closings are possible the rest of this year. Shares of Urban Outfitters (URBN), which have plunged by roughly 10% since the fashion house reported disappointing earnings Tuesday, also were sharply lower in premarket trading again Thursday. Two more retailers, Gap (GPS), Aeropostale (ARO) are due to report after the close Thursday, as is tech giant Hewlett-Packard (HPQ). Despite the worries in the retail sector, U.S. stock futures were relatively stable in early trading. McDonald's (MCD) is also a focus point for investors and protesters Thursday as the fast-food operator holds its annual shareholder meeting in Oak Brook, Illinois. Over 100 people were arrested outside the McDonald's corporate campus Wednesday as they protested for higher wages. There could be more arrests Thursday as protesters are promising to return. 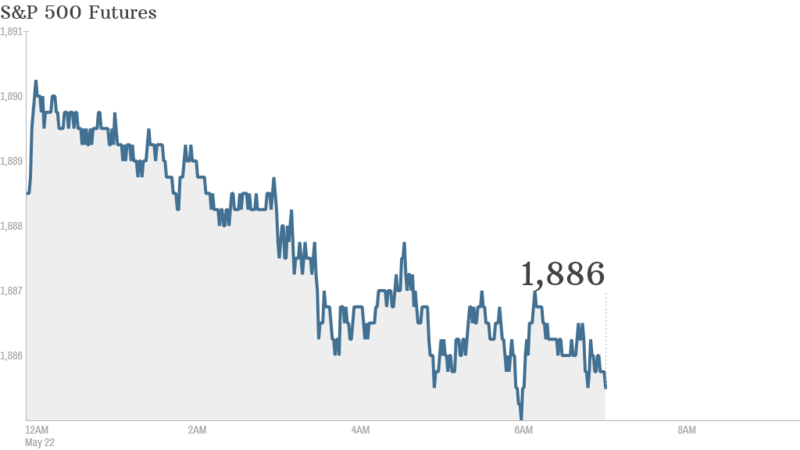 Investors will also receive a mix of economic data: At 8:30 a.m. ET, the Department of Labor will release its weekly report on initial unemployment claims. Meanwhile, the National Association of Realtors report on April's existing home sales will be released at 10 a.m. ET. European markets weren't making any big moves in midday trading, though shares in SABMiller (SBMRF) were up by 4% in London after the brewer released earnings. Meanwhile, shares in postal service Royal Mail (ROYMF) fell by as much as 8% after reporting its latest set of quarterly results. Asian markets closed mostly higher, buoyed by a bullish performance in the U.S. and better-than-expected manufacturing data from China. On Wednesday, all three U.S. stock indexes finished the day with solid gains, helping to recover from Tuesday's losses.